What characteristics we look for in a Teach to One school partner. New Classrooms partners with schools—traditional district-run, public charters, and independents schools—that choose to replace their traditional, textbook-based math program with Teach to One. 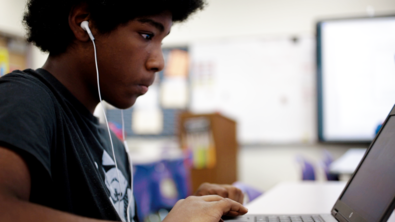 Unlike a textbook publisher or technology vendor, we partner with schools throughout the school year, providing them with a combination of digital and live instructional content, student assessment, data analysis and reporting, operational consulting, technical support, and professional development to enable personalized learning for each student each day. Teach to One is not a product that gets dropped off at the schoolhouse door with a 10-point instruction manual. Rather, it requires serious commitment on the part of each school community to a meaningful change in how teaching happens. Not every school is ready for this type of partnership—or is logistically able to implement the changes Teach to One requires. We take great care on the front end to engage with potential school partners well before the beginning of each school year so that all parties can assess whether the conditions are in place for a successful implementation. Many associate New Classrooms with technology, but those who’ve studied our model know that the level of collaboration that teachers must have with their colleagues is very different than when implementing the latest app or hardware device. In Teach to One, teachers operate as a team in an open and highly collaborative learning environment that enables them to work with groups of students with common needs each day. Students may receive instruction from any of the math teachers each day, creating an environment where teachers go from teaching as neighbors to teaching as roommates. This can change the role of the teacher quite a bit. Because teachers work as a team, they must collectively norm on everything from behavior to operating processes to substitute teacher plans. In doing so, they must emerge with a unified voice on the best way to address various challenges. This represents a whole new level of collaboration, which can be challenging for teachers. It can also be a welcomed addition to teachers’ often professionally-isolated day-to-day work. Bringing Teach to One into a school and working through the learning curve that comes with the introduction of such an entirely new approach to teaching and learning is a daunting task. It takes a pioneering school leader to have the vision and commitment to champion this level of reform and see it through the initial growing pains. Each school has its own unique culture. Some hallways are noisy; others are silent. Some schools ensure rules are consistently enforced; others not as much. Some schools build a warm and supportive climate for students to learn in; others can feel cold and even antagonistic. Teach to One is not pixie dust that can be sprinkled on top to solve school culture challenges. Successful implementations require a teaching staff that is guided first by what’s best for students, that genuinely like and respect one another and their students, that take their own professional growth seriously, and that are focused on the details required to do things well. No school is perfect, and we understand that in every school there are things that can always improve. But if there isn’t a positive and constructive culture underlying how a school operates, it is hard for a partnership to be successful. Even when schools have the right spirit of collaboration, leadership, and culture, there are a number of logistical issues that need to be addressed. What is the availability and usability of space in the school? Does the school have access to the requisite technology, both hardware (computers) and infrastructure (Internet)? Does the school have the flexibility in schedules to repurpose time in the way that enables Teach to One? The answers to these fundamental questions are important in our consideration of a school partner as it impacts a school’s ability to operate the program with fidelity. Now in our third full program year, we’ve found that these are the most critical elements to a successful partnership. You’ll notice that success has nothing to do with a school’s demographics or years of experience or comfort with technology. We’ve seen success across the spectrum on all of these dimensions. In the end, a school’s belief in the power of personalized learning and willingness to partner with us on this journey is most important. We’re currently exploring partnering with a limited number of new schools for the 2015-16 school year and have already begun the process of speaking with teachers and school leaders from across the country. In those meetings, we try to be transparent about the benefits and trade-offs and the importance of the qualities above. If your school or district believes in the power of personalized learning and is interested in learning more about partnering with New Classrooms to implement Teach to One, we invite you to fill out our Partnership Interest Form and we’ll send you our Pathway to Partnership overview. Joel Rose is the Co-Founder and CEO of New Classrooms. Chris Rush is the Co-Founder and Chief Program Officer of New Classrooms.